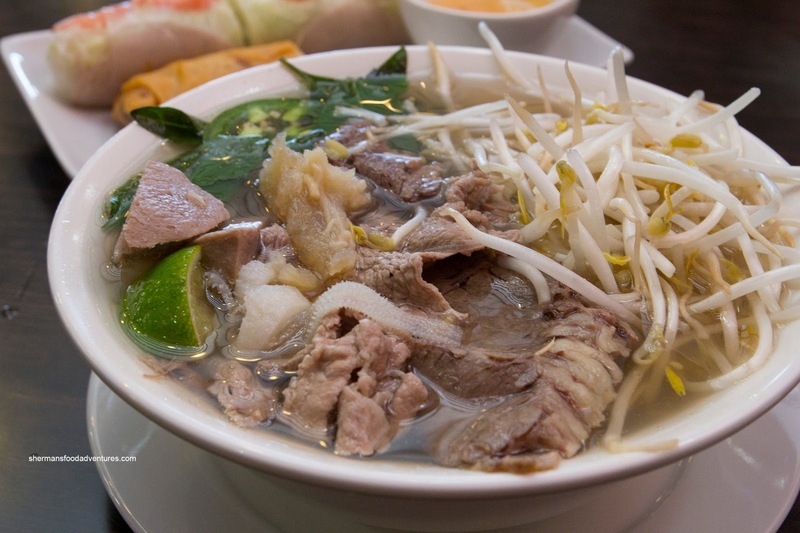 It's no secret that I love Pho. 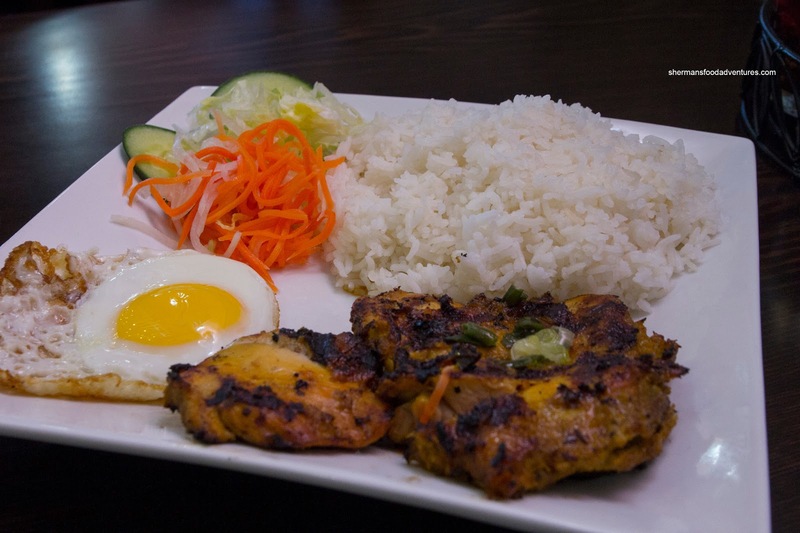 Heck, I love Vietnamese food in general. And what's not to like? Usually plentiful tasty food at low prices. Therefore, it is a regular cuisine of choice while I'm with friends, family and alone. In fact, it is one of my go-to destinations when I'm dining all-by-myself (think Eric Carmen). Yes, the casualness and relative affordability are determining factors. Now, good Vietnamese food is not really all that hard to find in Vancouver and Surrey, but not so much everywhere else (especially out further in the burbs). 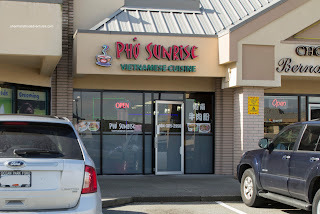 Hence, I was intrigued with Pho Sunrise as it is located in a mall complex in White Rock. 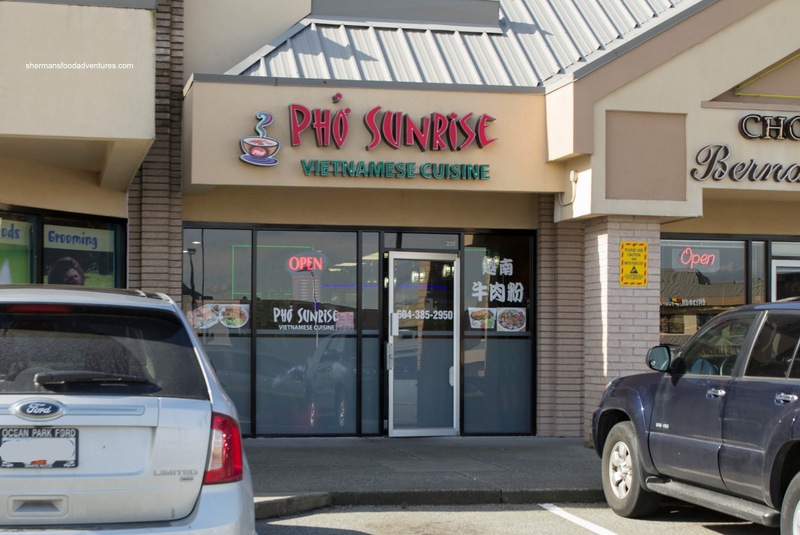 Yah, Pho and White Rock doesn't roll off the tongue that much, but hey, gotta try to know right? To get a good handle on the food, I decided on 3 items to the utter shock of the waitress. I explained that I was very hungry (which was true). 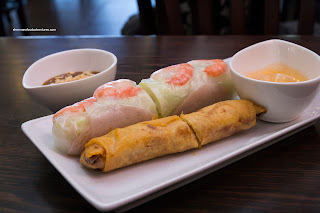 I started with one each of the Spring and Salad Rolls ($5.25). Despite the use of a wheat wrapper, the spring roll was actually quite good. It was crisp, hot and packed full of moist pork. I liked the sweetness of the onions and the slight hint of fish sauce. As for the salad roll, the rice wrapper was a pleasing texture of chewy while soft. On the inside, there was there was sprouts, lettuce, vermicelli, ham and shrimp. Nothing was amiss, but I would've liked to see some basil. The dipping sauce was sweet while lacking in peanut flavour. My first entree was the Pho Dac Biet (Small $6.95) which was chock full of meat and chewy noodles. I found the steak to be slightly chewy due to some gristle while the brisket and tendon were tender. The broth was light and mostly sweet. I liked the modest use of MSG, but in the end, it was in need of more depth. 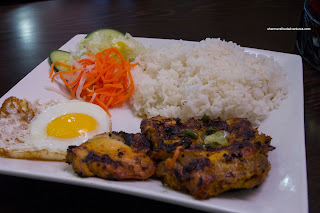 Lastly, I got the Lemongrass Chicken and Fried Egg on Rice ($9.50). The rice itself was a bit clumpy and dry, but the runny egg yolk did help its cause. The chicken exhibited a nice char and smokiness while being slightly dry. It did have a good lemongrass hit though. Believe it or not, I almost finished all the food to the bewilderment of the waitress. It was not bad considering the location of the restaurant. Love your blog Sherman, so entertaining, and this restaurant is a fave for me. 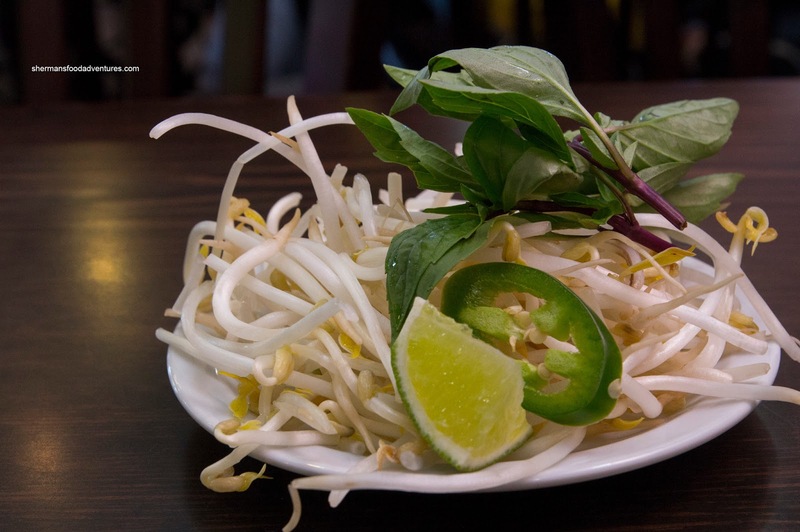 Tried Pho Tam on your rec.and did not like, sorry. @Keith No worries. Food is subjective!